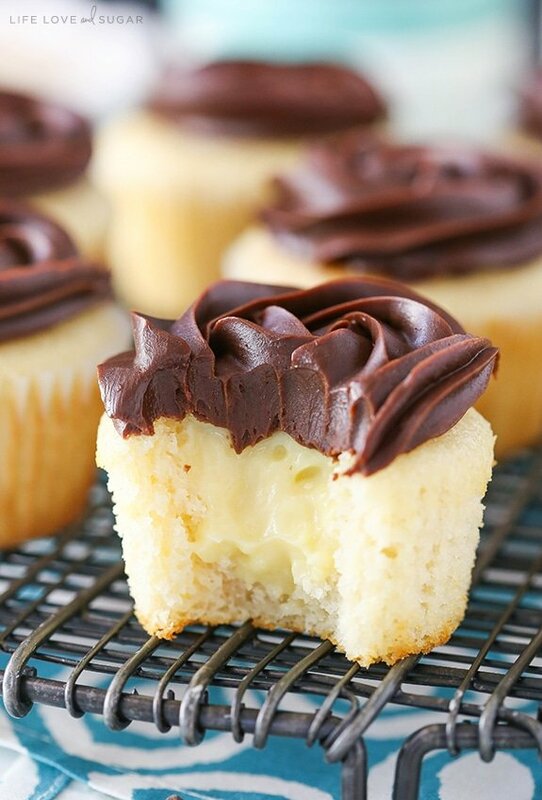 These Boston Cream Pie Cupcakes are to die for! 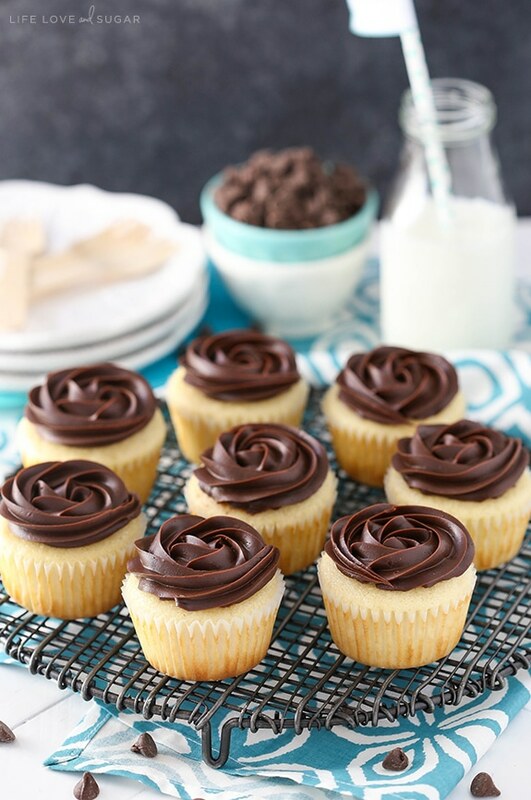 A moist vanilla cupcake, pastry cream filling and beautiful chocolate ganache topping make this one tasty cupcake you will definitely want to sink your teeth into. So I guess today is the day that I will dispel the myth that I have always been an amazing baker – just in case you were under that impression. 🙂 The truth is, I grew up cooking with my mom, not baking. Sure, there was some baking around holidays, but day-to-day was all about the cooking. So when I started baking several years back, it was quite an effort to really learn what I was doing. Lots of hours have been spent in the kitchen. With cooking, I was used to being able to throw things in a dish and not have to worry too much that small changes to a recipe would ruin it. With baking, it’s a whole different ball game. Small changes can make a huge difference – and be incredibly frustrating. So back around the time I started baking, I was taking a lot of the desserts I’d make into work. I’d ask co-workers what their favorite dessert or flavor was if what was their birthday and then I’d challenge myself to come up with a cake. It was a great way for me to try things I hadn’t tried before – the best way to learn! Even now, I still love unexpected requests that give me a challenge or get me to step out of the box. Well one such request was for a Boston Cream Pie – and I had never even made pastry cream before. Ever. I had no idea what I was doing. But I found a recipe and went for it. I’d been fairly successful up until this point, so I figured it’d be all good. I had no idea what I did at the time and it’s been so long that I don’t even remember what recipe I used to look back and figure it out, but I remember wondering how in the word the pastry cream would thicken enough to hold up between cake layers. Ultimately the cream was much too thin and by the time the cake made it’s way to work, it was basically two layers of cake that used to have pastry cream between them, but was now in a puddle around the bottom. Major fail. Well fast-forward about 5 years and that co-worker has moved on to another adventure. It was sad to see him go, but I was happy for him in his new path. I find pastry cream to be much less intimidating these days. I now know that cornstarch and the egg yolks are what actually thickens the cream and I’ve made pastry cream more times than I can count. 🙂 It’s actually pretty easy to make and quite delicious. The pastry cream sits in the middle of one of my favorite vanilla cupcakes. 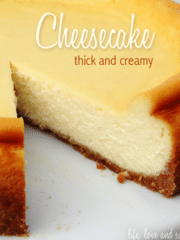 It’s light, moist and has great vanilla flavor. Like many cupcake recipes you’ll find on here, making them starts with creaming the butter and sugar. I will say it over and over – be sure to fully cream the butter and sugar. This ensures a fluffy cupcake. Don’t skip it! 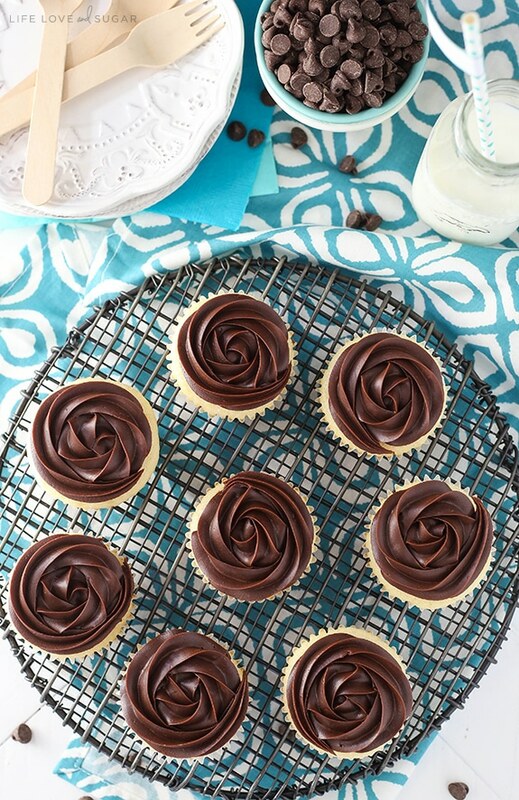 The cupcake is topped with the most delicious chocolate ganache. It has a little corn syrup added to it to keep the ganache looking glossy and fresh. Once the ganache is made, it’s set in the fridge to get firm, then can be piped onto the cupcakes. Even though roses aren’t super manly – and these were technically for a guy – I decided to go with the roses on top for these cupcakes. They are just so pretty! And honestly, there were no complaints. Only happy moans as they ate the cupcakes. In fact, a few of them are going to be quite happy to finally see the recipe on the blog so that they can make them at home. You have more than redeemed yourself. Honestly, we all have massive baking fails early in the game, and in my case, every month or so. 🙂 You never know when something is just going to implode in the kitchen. Fun times! 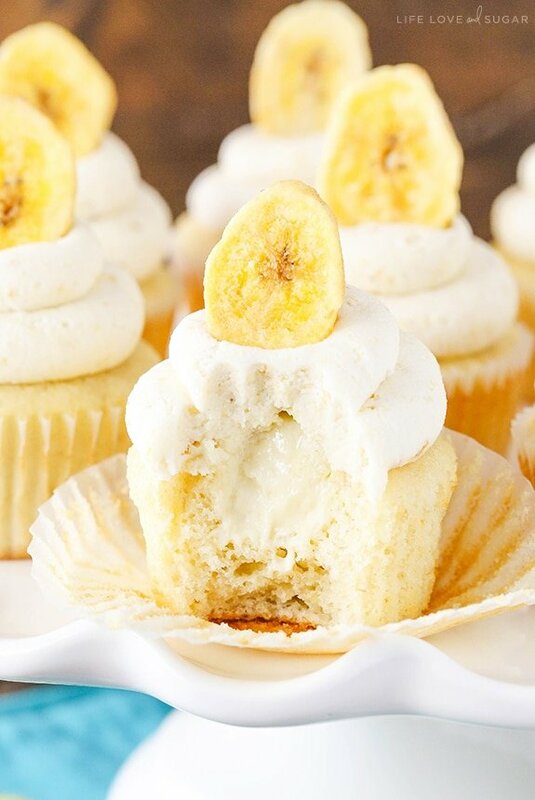 These cupcakes are perfect. I’m sure your coworker is super grateful for the cool sendoff! I love your recipes and this one is another fabulous creation. I can’t wait to make your recipe! 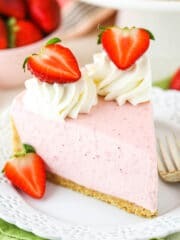 Is there a way to make these with a store bought cake mix? Sure, just use a vanilla cupcake mix. Wow, these are gorgeous. Just curious…..do you have a certain brand of chocolate chips you use? What brand of cupcake corer do you have? I can’t wait to make these. Mine look this these, but I actually got my set at Home Goods. I hope you enjoy them! Hi Lindsay….I want to make these, but I would like to make them into mini cupcakes …do you see a problem w/this and if not, how long should I bake them? Please reply. Thanks. My only concern is adding the filling – mini cupcakes may be a bit small for adding much filling. Other than that, they’d probably be fine. I haven’t baked this recipe as minis, but would assume the bake time should be around 8-10 minutes. Thanks Marilyn! You should be able to print all the recipes. Each one has a print button right within the recipe. Lindsay, I’m sure everyone was thrilled with these beauties! Glad you conquered pastry cream. I love filling cupcakes with pastry cream. Though I’m not a huge chocolate fan, I slather on the chocolate for the sake of my guests and just scrape it off mine — someone is always happy to take my “scrapings”! I love your recipes. Most of my banking is done with your recipes. For some reason I cannot get the print button to work on the Boston cream pie cupcake recipe. Maybe there something you can do to fix that. Praying for you on your baby journey. I hope things are going well for you. Thank you. Thanks Kelley! 🙂 I just tried the print button and it worked for me, so I don’t know what’s wrong. Maybe try a different browser? These look amazing!! 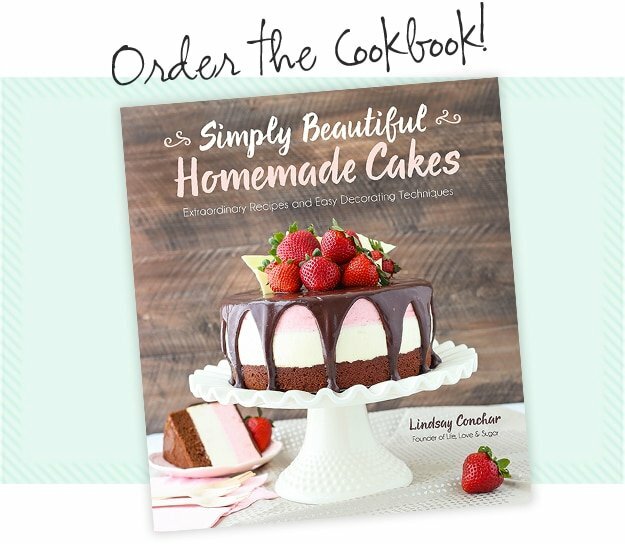 I’d love to make this as a two layer cake…have you tried this? Thanks Kim! I haven’t tried it with this recipe. 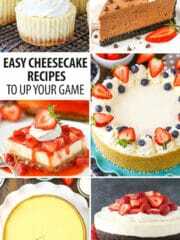 Love this recipe and make the perfect amount of cupcakes but I was wondering is there a substitute for the source cream like yoghurt or something else? I haven’t tried yogurt, but I think using additional milk would work ok.
Made it! Fun recipe! My partner is worried he will not get any lol! To bad!! I’m always looking for great treats to make that my wife can eat. Here’s the bottom line… NO corn products of any kind. So, no corn starch, corn syrup, corn oil. 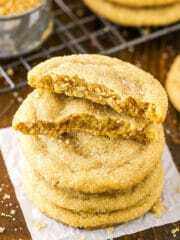 I have solutions for baking powder (25% corn starch so I make my own easily) and corn syrup (agave syrup) I usually use guar gum to replace corn starch as a thickener, but would like to know whether flour or mashed potatoes would be a better choice. These look so delicious! 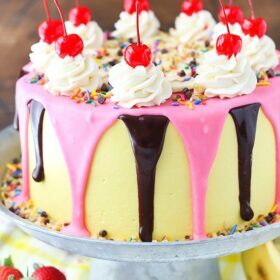 I would like to make them for my son’s birthday this week, but have a quick question: How can the “Light corn syrup” be substituted? Maple syrup? Any other ideas? TIA! You can actually just add some additional heavy cream or leave it out all together. The main purpose of it in this ganache is to give the ganache topping a glossy appearance that doesn’t fade. Can you substitute milk with almond or coconut milk? I haven’t tried it to be sure. I would think it’d bake ok, but the difference in fat content would probably change the cupcake texture a bit. If you need someone to take bites out of your cupcakes before you photograph them, I’m cheap and available. My Grandma use to make the most amazing Boston Cream Pie. Haven’t had it in years. I’m anxious to try these. They look so good! Going to post The Good, The Bad, The Best, and The Worst…. I’d have to agree with you on the negatives. Just finished putting these together, following the recipe to a T. I found the cupcake to be a bit bland and it was a tad dry. The custard was runny, and i found it very, very sweet; I’d probably cut the sugar down to 3-4 tbsp at most, and reduce a little milk/add a little more cornstarch/add another yolk, and I would also cut the vanilla in half (if you’re using a pure vanilla for sure). The ganache was VERY thick and put my carpal tunnel to the test, haha. I think I would omit the corn syrup and maybe do half semi sweet and half milk chocolate for the future. I’m sorry you had trouble with the recipe turning out. Maybe I can offer a few suggestions. The cupcake should definitely not be dry. I’ve made it no less than 30 times and haven’t ever had that problem. Two of the most common culprits are over baking and inaccurate measuring of ingredients. To test for doneness, use a toothpick to stick in the center. 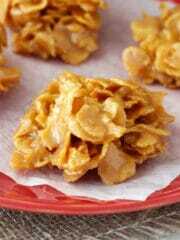 They’re done when a few moist crumbs stick to the toothpick when pulled out. For measuring, the best way to ensure accuracy is with a scale. It’ll never be wrong. 🙂 If you’re using cups, be sure to stir your flour and loosen it before scooping. Too much flour will definitely dry out a cupcake. 🙂 For the ganache, it definitely shouldn’t be too thick, but it’s simply a matter of the amount of heavy cream vs chocolate chips. If you found it too thick, you can heat the ganache back up in the microwave and add a little more cream until you are happy with the consistency. The custard is harder for me to diagnose without being there, but these sat outside in the heat for about 1 1/2 hours before people ate them (it was a lunch for someone and dessert came at the end – we were outside) and the custard still held up fine. It’s possible that the custard wasn’t cooked quite long enough. You are right though that if you want to play with it the amount of milk (liquid) and cornstarch/egg yolks(thickeners) would be the place to do it. I hope that helps! So just to confirm, you do not beat egg whites before adding? * They were perfectly domed when I took them out of the oven, but started to get flat while cooling, is that normal? * Can I possibly use the cupcake recipe for cake? Hi Anna, they may become a little flatter when cooling but it shouldn’t be drastic. And yes, I usually double it for an 8 inch three layer cake. Do you have any suggestions on the filling, I thought I had corn starch but it’s corn meal that I had. Is there any other way to make it? Hi I never bake from scratch usually because I’m time poor but I’m also not very confident. I made these cupcakes as a test – entering a baking competition at work this week and thought I’d find something different….they turned out great!!!! Thanks for the receipe I’ve turned a corner, look out more baking to come ???? I made the cupcakes without the filling. They are unfrosted. Can they be frozen, and for how long? The party I made them for was cancelled indefinitely. Yes, they can frozen. Just be sure to wrap them well. I’d recommend defrosting them in the fridge when you’re ready. Not sure how long is best, probably a month-ish. Are we supposed to beat the egg whites before in incorporating in to the recipe it put it raw. Please as advise. No, they are not beat before adding. I’m 16 and i made these for my family and friends! I finally got to use my new stand mixer that i got for my birthday. When mixing i noticed the sour cream looked clumpy, but i stood it out and after i added the flour mixer, it looked beautiful! The custard i made was a bit runny but i re-heated it again over the stove for about 2 minutes, i realized i probably didn’t cook it long enough. Overall 5/5, i loved these, my family and friends loved these, and i will definitely make these again! Thanks for the recipe! Gosh I tried the cupcakes and they tasted absolutely horrible , it had an after egg taste even the second day the egg taste still didn’t go away. However the cream filling was good and didn’t taste at all as eggy as the cupcake. I’m planning on making these, but I’m a little short on cream for the ganache. Would it be okay to use half cream and half whole milk? Thanks! I haven’t tried it but I’ve heard you can use butter and whole milk instead of the cream. Thank you for the recipe! I tried these and they taste great! The only thing is the chocolate was runny. To be honest though I didn’t let it cool completely my boys really couldn’t wait, next I’ll try the banana cupcakes! 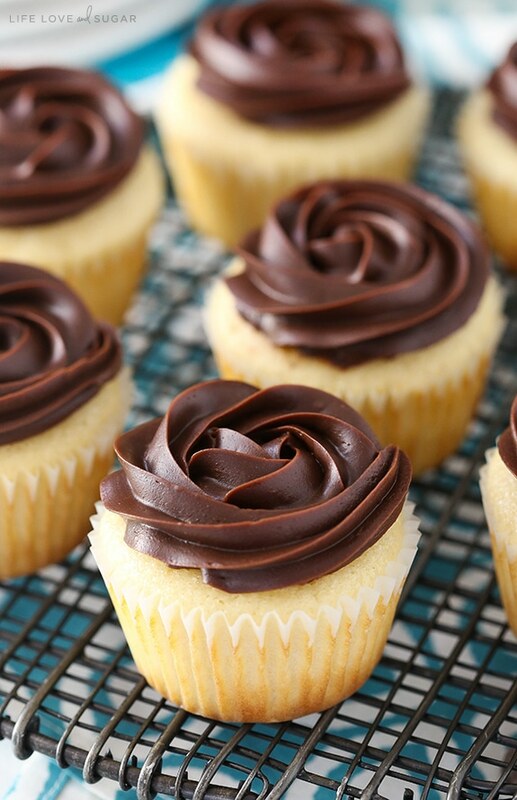 The recipe is written to make regular sized cupcakes, but I’m sure you could make minis. I was so excited to make these for my son because he LOVES Boston Cream Pie. Followed the recipe to the letter snd was quite disappointed. The chocolate ganache was soooo overpowering! Tasted bitter also! It’s possible that you used a chocolate with a different amount of cocoa – like a dark chocolate? Mine was semi sweet chocolate chips, which I prefer. But the ganach became dry and hard as soon as i added corn syrup.i use belcolade chocolate.its belgium..it is a very nice brand . At what point did you add the corn syrup? From the way you wrote the comment, it sounds like you added it separately from the warm cream. The corn syrup and cream should be heated together and the poured over the chocolate. If you add the corn syrup separately and it’s cool, it can cause the chocolate to seize/harden. I see what you’re saying Erin. I’ve added the syrup both to the chocolate chips before adding the cream, and added the syrup to the cream when heating it. Either will work. The issue is if you add the syrup after combining the cream and chocolate chips. The syrup will not be at a warm temperature, like the cream and chocolate, and will therefore cause things to seize. I was so happy to see that these are actually made from scratch, not cake mix and cool whip. Can’t wait to try them! Awesome! 🙂 Thanks Amy! So glad you enjoyed them! I can’t wait to try these! We are living in Germany and I miss good ole Boston Cream Pie! I really love that your recipe has English and Metric units…thank you. I feel it is much more precise when I can use my kitchen scale and use metric units to measure everything out. Baking is so much more precise than a skillet or crockpot meal! I’ll post back after we try them out! Thank you for all the variations too!!! Looking forward to trying them all! can i make the ganache the day before and just refrigerate until I’m ready to apply it the next day? You can make it ahead, you just might need to reheat it a bit so that it’s pipe-able again. Hi! 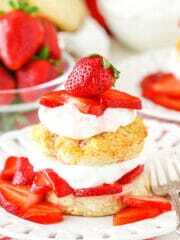 Firstly, thanks for posting this recipe! 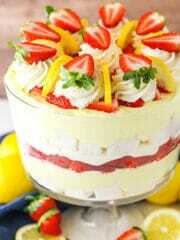 It looks soon yum! One question I had is if you used powdered sugar or granulated sugar for the cake? I use granulated sugar in the cake and powdered sugar in the frosting. I made these cupcakes this morning. I think they turned out well but I can’t pipe the ganache. I tried 3 different times with different piping tips. It was way too thick and tough. I tried to microwave it. I tried to thin it out with milk. I have no idea how you did it but I ended up just spreading it on the cupcakes. I’m so upset and dissapointed. I made sure I followed your recipe exactly and doubled and triple checked before I did anything. I was just curious how many cupcakes this recipe makes. can i use salted butter instead of unsalted? or will it change the recipe texture and flavor? Yes, you can use salted, just don’t add the extra salt in the recipe or it’ll be too salty. These look amazing! I can’t wait to try them myself! In the video it says baking soda but in the recipe it says baking powder which one is it please. Follow the written recipe. I thought the video had been fixed, but it seems the wrong one was uploaded. Thanks for letting me know so I can fix it. Hello Lindsay. Thank you for this. Could you please tell me if you use milk or heavy cream for the filling. In the recipe it says milk but on the video it say heavy cream. Thanks. Sorry about that – I will get the video fixed. It’s milk, as per the written recipe. I WILL TRY THIS!!!!! Looks absolutely fantastic. Thank you!! 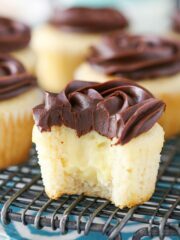 I just made the Boston cream cupcakes & they are UNBELIEVABLE!!!!!!! Thanks so much for sharing!!! This recipe it’s a keeper! Soooo yummy!!!! What brand of vanilla did you use? My cupcakes always look an unappetizing shade of tan, instead of the pretty white or yellow that I always see in people’s blog posts? I’m so disappointed!! ???? Is it possible that there was a typo on the amount of powder? 2 tsp sounds like a bit much for such a small amount of flour. My cupcakes rose beautifully but fell and shrunk away from the sides of the pan while cooling. I followed the recipe to the letter (including weighing the ingredients) and I’m really sad to have wasted the ingredients. My pastry cream is divine, however, so I’ve popped it in the fridge and will retry the cakes again tomorrow. Maybe with 1/2 the amount of powder and just a pinch of soda. No, the baking powder is correct. I’ve actually made these quite a few times. Are you sure you fully creamed the butter and sugar together? I find that’s often the issue. 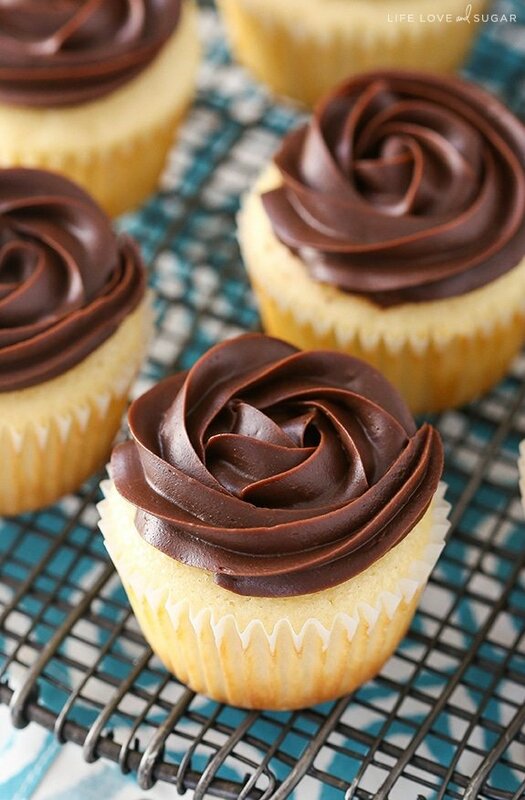 Thee look delicious….if I have any leftover can the whole cupcake be frozen? That should be fine if they’re well wrapped. These cupcakes were unbelievable! Just ask my boyfriend who ate 6 in 2 days haha perfect recipe!!! He said they might be the best cupcakes I have ever made. Had rave reviews at the office as well! Well done on an amazing recipe! Awesome to hear! So glad you enjoyed them! these cupcakes where a complete disappointment, my first batch was horrible, the custard was runny and the chocolate was too overpowering, I tried again, and once more I followed step by step directions measuring the ingredients to the core and still. ???? dissatisfaction. The video I’m looking at just above the recipe shows milk, not heavy whipping cream. If you’re referring to the one on Facebook, it’s an error but FB videos can’t be updated. The written recipe and video in this post are correct. Hi ???? I haven’t made these yet but they look delicious! I’m just curious as to why you use a mix of milk and water in the cupcakes and not all milk please? Thanks ???? I find that it produces a lighter cupcake. Hi Lindsay, greetings from Singapore! I made your cupcakes and they tasted so good esp the cream filling. The cake is very soft not dry at all. Why do you use all egg whites? Do you think i can put in 3 whole eggs? My ganache is abit wet, the 1M tip I used didnt quite pipe out the nice floral swirls. How do I ensure the consistency is right to pipe? Thank you! 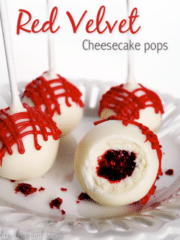 I want to try these because they look amazing! Can i use maple syrup for the ganache? You could just leave out the syrup and add an additional tablespoon of heavy cream. Otherwise the maple syrup shouldn’t hurt anything. Hi there! Do you think I could make the filling pink with food coloring for a breast cancer awareness bake sale? Hi Lindsay! 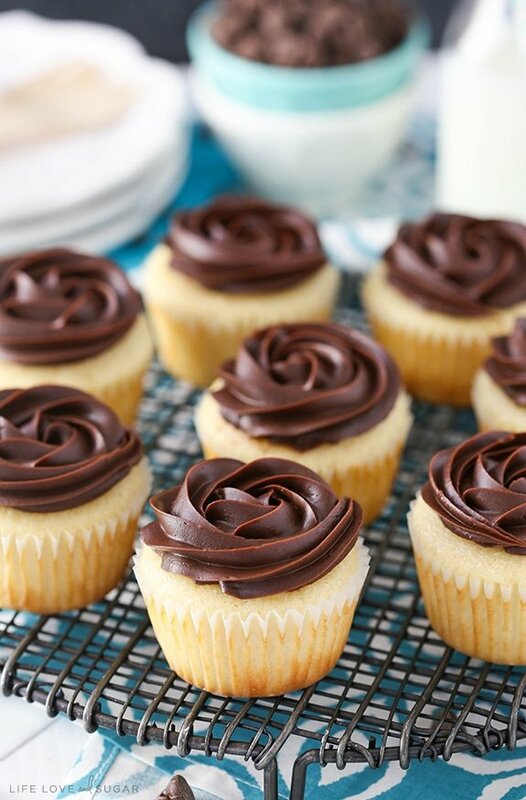 I’d like to try this cupcake recipe but I don’t have sour cream as of the moment. Do I replace them with buttermilk or plain whole milk? Or should I just leave it out? I would suggest replacing it with additional milk. The batter will be thinner. Greetings! I’ve made these now twice in a row and the second turned out much better than the first as I really took heed in following the directions as precisely as I could. They’re such a hit with everyone, thank you! I do have a question I’m hoping you can help with. 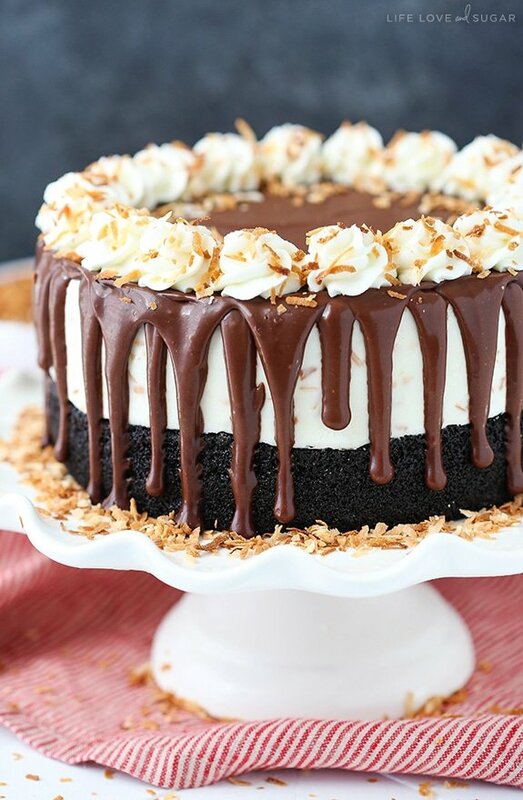 Your photos and video make the ganache look thick and light in chocolate. I use Nestle semi- sweet chocoalate chips, light corn syrup and the boiling heavy cream. The ganache looks great, with the nice glistening from corn syrup. And it comes out great tasting but it appears softer in texture than yours and fairly dark. 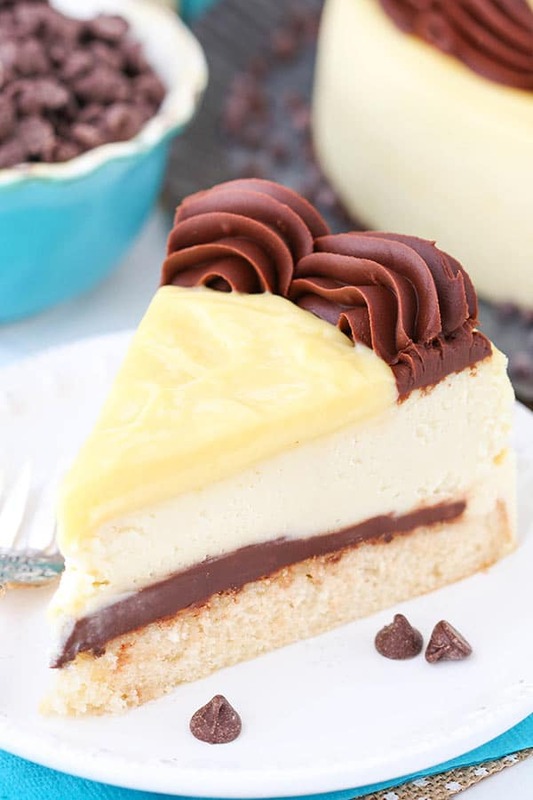 I mean, it looks like Boston Cream Pie, but yours looks more like a thick frosting to me and I would like to achieve that if possible! Thanks for your web site, I love it! I’m glad you’ve enjoyed the cupcakes. It would be hard for me to say about the difference you see in the photos. I use the same ingredients you mention, including Nestle semi sweet chocolate chips, so I’d expect the color to be the same. It could be something about the lighting of the photos that might make it look a little different to you. If you think the ganache should be firmer, you could reduce the heavy whipping cream slightly. We made these and reviewed them in Episode 51 of our baking podcast, Preheated. Sooooo good! Hi! I really enjoyed making these, and they taste great but I have a question. I found the cake has a slightly different texture to regular vanilla cupcakes. I’m not sure if it’s something that I did wrong or if it’s meant to be like that. they had an almost spongy/chewy texture, but somehow the texture works well with the flavors. but is it meant to be like that? Hi. What do you do for high high altitude 8000? I’m sorry, I’m not really familiar with high altitude adjustments. Is there a way to print this recipe – it sounds delicious, but I don’t really want to write out the entire recipe? Yes, there’s a little teal “print” button within the pink recipe card. Hi there! I have always struggled with figuring out what to do for high-altitude as well. I came across this video on YouTube, and it has saved me!!! This is, I think, part 2 of the explanation, but the white board he’s showing has the adjustments on it. If you have time, I recommend watching the first one as well – it explains the “why” behind it. Hope this helps you as much as it’s helped me! What would be the ratio of ingredients for 24 cupcakes please? thank you? And can I make them a night before and store them.in fridge? Thanks for sharing! 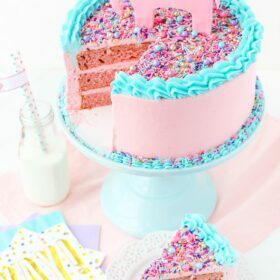 The frosting looks amazing! How soon before serving can I frost them? You could frost them right before serving, if you like. They should be fine. I made these this weekend for my husbands birthday because Boston Cream Pie is one of his favorite desserts. These are seriously delicious, the cupcake recipe alone is now my new go to one! Only issue I had was with the ganache. I followed the ingredients and method exactly but when I pulled it out of the fridge to top the cupcakes, it was way way too thick. Even letting it sit out for a while didn’t help. I ended up having to mould little chocolate ganache “discs” to top the cupcake with! Could you possibly shed some light on where I could’ve gone wrong? Despite the little mess up, they were still delicious and my hubby is still a happy camper! I’m glad you enjoyed them! Ganache can be a little tricky sometimes. Did you use semi sweet chocolate, or another kind? They all have different amounts of fat that can affect the consistency. Yes I used Costco brand semi sweet chips. And heavy whipping cream, instead of heavy cream? Again, it’s a fat content thing. The amount of fat affects how soft the consistency is. Beyond the fat being an issue, it’s hard to say. It’s a balance of the liquid and the chocolate that gets the right consistency. 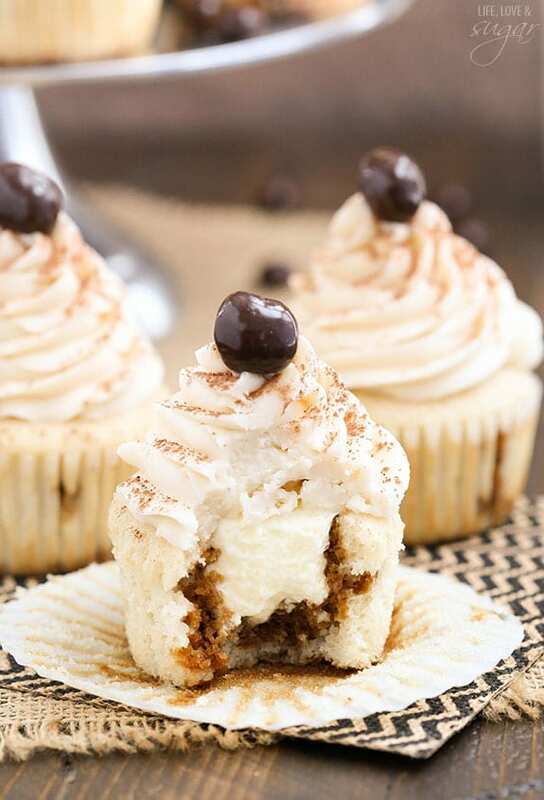 If you try the cupcakes again, you could always try adding another tablespoon of cream. I made these yesterday for my husband’s birthday. They were a huge hit. There are a lot of steps but you made this so easy to follow. I have never made pastry cream before – and I have always been too intimidated to try. This all went together so much easier than I expected. And each part was delicious. I am new to your site but it is an instant favorite, just like these cupcakes. Back online to write a review and find the next recipe to try. Thanks! Awesome! So glad to hear they were easy to make and that you enjoyed them! Thanks Kristine! (1) If you end up refrigerating the ganache too long and it gets thick, put it on a double boiler for like, 20 seconds. Go ahead and have the water boiling nice and hot and then put your ganache bowl on top, just long enough to only really warm the bowl. Take it off and stir until everything is one smooth consistency. Repeat if needed. (2) If like me, you had a good bit of cream left and a lot of ganache left, make cake balls. I just used the bits of the cupcake I cored out and mixed some of the cream in (about 50/50). Freeze until firm. Then melt the ganache using the double boiler method and coat the cake balls with it and freeze again. I’m so glad you enjoyed them! Thanks for sharing your tips! I followed this recipe to a T and didn’t have any issues with the filling or ganache; not only did the cupcakes look beautiful but they tasted amazing!!! your directions were very easy to follow. I Made these for my mom for Mother’s day cuz she loves Boston Cream stuff and she had 2 cupcakes (which is unheard of for her) Thanks for helping to make Mother’s day extra special! My big issue is that both times the cupcakes came out REALLY Dense. Almost like mini Pound Cakes. Do you have any suggestions on how to fix this? Otherwise we love the Pastry Cream but the Chocolate Ganache is just a tad strong for our tastes. Hmmm, strange. Normally I’d suggest the creaming, but it sounds like you’ve got that covered. It’s hard to say, but potentially over mixing at the end. 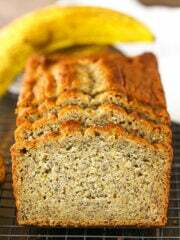 It can over develop the gluten and make a dense cake. Do you weigh your ingredients? It’s possible that if you use cups, something is a little off. I’m not sure from a distance, but those are a couple possibilities. Thanks for the reply. No I don’t weigh out my ingredients, but I do measure them out using “Cups and teaspoons/Tablespoons”. Just a thought. Would it help if I beat the Egg Whites first? Get them up to soft peaks and then mix them into the rest of the cake batter? I’m assuming you tested the recipe including alternate methods, so can I try this or just watch the mixing times on the recipe as is. It’s been quite a while, but I do believe I’ve done that and found it didn’t make much difference to the final result and wasn’t worth the extra steps. You could certainly give it a try though. 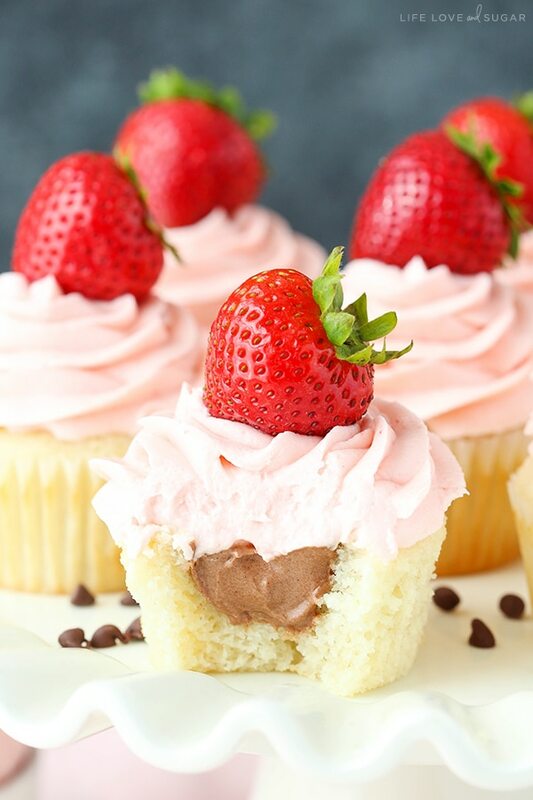 I made the cupcakes with cake flour and they turned out heavenly, light, fluffy, moist, reminded me almost of angel food cake, best from scratch cupcake recipe I’ve come across. The ganache was another story, it was way too runny and didn’t hold the flower form at all. let the mixture sit overnight and then for good measure, put it in the freezer for an additional 4 hours. As soon as I piped, it began to melt and caused a large mess. I will play with the cream amount next time. Otherwise, the cupcakes were divine. Thanks! I followed this recipe to a T. The custard to to die for. I could have sat down with a spoon and gone to town. The ganache was waayyy to heavy & strong for me – I couldn’t really taste the actual cupcake and custard because the ganache was so overpowering. I, like others, ended up with a very dense cupcake. Also, 2 hours for the ganache in the frig was too long, I could hardly get it to pipe. Maybe an hour & half would be better. Thank you for the recipe . If i ever need custard – this would be my go to recipe! Thanks Meghan! So glad you’ve enjoyed all the recipes! I’ve had some people experience both too thin and to thick frosting, as well as having it just right. It’s hard to say what the issue is, but one question would be did you use semi-sweet chocolate chips or another chocolate? Different kinds of chocolate use different amounts of cream, so that could cause a thinner ganache potentially. I made these for a school bake sale fundraiser that my daughter’s school holds each week. They were a huge hit and I was asked to make them again! I didn’t have any corn syrup so I just skipped it, I’m used to making ganache without it anyway and it worked out just fine. Wonderful! So glad they were such a hit! Hey! I’m just wondering do I have to use corn syrup for the ganache? And do you know a substitute for sour cream? Thanks! You don’t have to, but I’d recommend it. It’s going to make it easier to pipe. You could try replacing it with honey. Or you could leave it out, but it will affect the texture. As for the sour cream, yogurt would be fine. Hello! 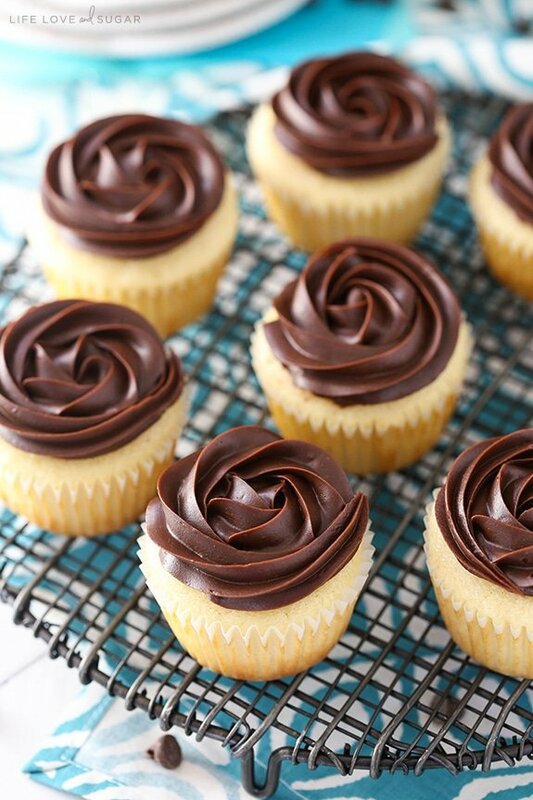 I have been dying to make these cupcakes for some time now and I am finally going to try them out today! I just had a quick question before I start. I noticed in the recipe that you have both the milk and the water at room temperature, is there a specific reason why? I’m not a big cupcake or cake maker so I was curious to know if the temperature had some kind of effect on the cupcakes as opposed to using cool or cold. Thank you and I look forward to making these!! Generally speaking room temperature ingredients incorporate better and evenly. But, if they are cold they should be fine. So glad you enjoy them! You can use yogurt. It’ll change the texture and flavor just a bit, but it’ll be fine. You could also use a little more milk. made this recipe and the end result was delicious, and extremely easy to make!!!! My daughter and I made these cupcakes yesterday and they are the BEST cupcakes we have ever made. Thank you for a delicious recipe!